Version 2019 of all-in-one desktop calendar software officially released. Desktop calendar software will help you manage appointments, to-do lists, schedules, and more. Make appointments and set up alarms to remind you of upcoming events, meetings, parties, vacations, birthdays, anniversaries, etc. It allows you to view all your events in a daily, weekly or monthly overview. You can also print your calendar in day, week or month view. Using all-in-one desktop calendar software, you can create single or recurring events and tasks. You can also color-code different appointments and tasks. Drag-and-drop feature allows you to easily reschedule an event or change its duration within seconds. Desktop calendar presents a different calendar image each month, just as a conventional wall calendar does, but it offers you far more than that. You can customize and have your own monthly photos on it. All-in-one desktop calendar software can be set up to open automatically with Windows so that it is the first program viewed. This means that your calendar is at your fingertips at the start of every day. Address book / Contact manager keeps track of friends, family, and business contacts. You can store mailing addresses, e-mail addresses, Web links, and phone information and add some notes for each contact. Internet Explorer-compatible Web browser with built-in pop-up blocker. This no-nonsense pop-up blocker blocks pop-ups and pop-unders when you're surfing with All-In-One Desktop Calendar Software. When the download window appears choose "Open" or "Run" depending on your version of Windows. Buy All-In-One Desktop Calendar Software today for only $39.95. This is a one-time fee and the calendar will never expire. Your order will be processed in real-time, usually within a couple of minutes, and the registration code will be sent to you by email within 24 hours. Softpedia guarantees that eCentral is 100% CLEAN, which means is does not contain any form of malware, including but not limited to: spyware, viruses, trojans and backdoors. This software product was tested thoroughly and was found absolutely clean, therefore it can be installed with no concern by any computer user. "Best personal organizer I've used"
It can manage your appointment's, to-do's; that has a phone/address book, program launcher, etc.., this is one you need to at least look at...it is the best I've used in 8 years. ...eCentral is the best organizer program I have ever used. It has a very modern appearance with a nice calendar/organizer and address book. The web browser works well and even has its own popup blocker. The images that accompany each month are a nice touch as well. We are impressed with the quality of your product and encourage you to keep this high standards in the future. "I Love the Pop-up blocker"
Cool interface... Easy to use and it has everything I need in one software. eCentral saves me time and keeps me organized... MP3 feature is awesome. If you have any questions about your All-In-One Desktop Calendar Software. If you have any sales question about one of our products. Eshasoft calendar software will help you manage appointments, to-do lists, schedules, and more. The personal information manager (PIM) can be used as a combined calendar, diary, organizer (day planner / event calendar), and reminder. Keep track of dates, appointments, and annual events like birthdays, to-do items, and notes. Internet Explorer-compatible Web browser with built-in pop-up blocker. This no-nonsense pop-up blocker blocks pop-ups and pop-unders when you're surfing with eCentral. Manage Appointment, Event Calendar and Task. Schedule and reschedule appointments, events are as easy as "Drag and Drop", "Point and Click". Print Day View, Workday View, Week View, Month View Calendar and Task. Support printing calendar and task list in many view options and any time scale options, including daily calendar, work day (5-day) calendar, weekly calendar, monthly calendar print. Print Appointment/Task List Report. Support printing appointment or task list report. You can specify time range, appointment/task type, resource name as well as sort order. Make all of Your Resources Organized. Any time-consuming entity can be treated as a resource in MultiCalendar. For example, a lawyer, a consultant, a club, a meeting room, a call center staff, etc. You can have the tidy and clean view of all arrangements of resource in MultiCalendar. Schedule Appointments and Events. Use smart colors and unique & meaningful icons to stand for different event types. Remind You any Events and Tasks. Make yourself be reminded in advance. Share Appointments and Events among Resources. It's really time-saving to share events among resources. Calculate Appointments and Events Statistics Easily. Get detail statistics of time expense for any resource. Easy to use - records all occasions and events; Saves time - programs your recurring events; Plans ahead - quickly access event schedules; Notifies in advance - you'll never forget a special day; Customize - many personalization options; Protect - back-up and restore anytime; Smart Desktop Calendar is a personalized, easy to use and efficient program that quickly accesses your daily and upcoming events. So you can plan ahead and never forget that big day. You can personalize it, choosing daily display times, your image files as a background, and much more. So whether it's a personal or a business occasion, it'll be one you'll never forget! The software works on all Windows systems. Smart Desktop Calendar is designed to make your personal and business life easy. And it saves your time - you only need add recurring events once. With quick access to daily and upcoming schedules -- months and days in advance - you're always prepared for that big business meeting. And always remember to order flowers for a special birthday ahead of time. Customizable PIM on your desktop wallpaper This fully customizable calendar features notes, tasks, alarms, and displays its data on your desktop through blending with existing wallpaper. You can organize your data in layers and share them with other people on a local area network. The program can integrate with Outlook and show its appointments and tasks on the desktop. If you synchronize your PDA device (Pocket PC, Palm, smartphone) with Outlook then through this connection you also get a synchronization with PDA as a side effect. There are options for changing calendar icons, fonts and colors, marking weekdays of choice and marking dates with notes and/or alarms. You can have a text only version of the calendar and choose between displaying one, two or three months on the desktop. Recurrence patterns are available for both notes and alarms. An alarm can be stand alone or attached to a note. If interactive desktop option is enabled, the program accepts direct clicks on dates, notes and tasks displayed on the desktop. You can set each note to normal, private or invisible desktop view. Private notes are displayed as generic text reminder and invisible notes are not displayed at all. Printing calendar data is easy and includes an option to choose date range for printing notes. Special desktop pictures option allows you to add some of your pictures to existing desktop background. Comma separated values .CSV format is supported for data export and import. Tablet PC users should not worry as the program detects desktop orientation changes automatically. Finally, Active Desktop Calendar comes with world clock screen saver that shows your computer's system time, plus five major time zones around the world. 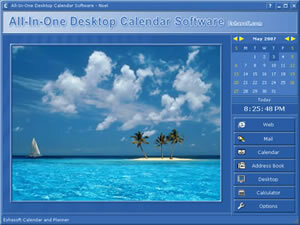 Desktop Calendar XP is a simple and cost effective way of beautifying the calendar on your desktop. It is a lightweight tool which will not clobber your system and its interface is very easy on the eye. The calendar covers two hundred years. It meets all your needs without much difficulty in setup or maintenance. It enhances the functionality of your calendar as it comes with a beautiful Real-time Desktop Clock and other useful inbuilt utilities such as MP3 Player, Wallpaper Manager, System Date & Time Changer, Date Calculator, Alarm, etc. It has also a Talking Buddy which will give some fun in the Desktop. Desktop Calendar XP comes with an Image Pack containing twelve beautiful images. Calendarscope is a full-featured calendar software for planning, managing, and scheduling appointments, meetings, birthdays, vacations, special events. It allows you to view all your events in a daily, weekly, monthly, or yearly overview. You can get a quick look at the events of a single day in any calendar view. Using Calendarscope, you can create single or recurring events & tasks, color-code different item types, set reminders for upcoming events, and more. A Drag and Drop feature allows you to easily reschedule an event or change its duration. Task and TaskPad views show all scheduled tasks, including Active, Overdue, Completed, and others as well as allow you to create and track tasks with a flowing deadline or without a due date. The Calendar Planner combines a complete calendaring solution with unique planning and productivity features, all in an intuitive, easy to use interface. Easily and quickly create calendars, adjust to schedule changes, and organize by event type, project, department, or any structure you choose. Show and hide or style groups of events with the click of a mouse, publish on the web, or share calendars on a LAN. Display and print in multiple views including, 24-hour scalable day view, 1 month, 1-4 weeks and 4 months. The Calendar Planner also provides, reminders, detailed notes, notes reports, show hide days, automatic weekly counting, day off management, recurring events, including automatically skipping days off, linking of events and complete control over the style and presentation of the calendar. Easy and Intuitive Desktop Calendar and Reminder Software for Windows. Friendly and Fully Customizable Interface. Personalize this PC Calendar Program with your photos, unique backgrounds, and stickers! Includes a To Do List and daily reminder alarm feature. Printable Desktop Calendars for 2017, 2019 and on. Monkeymen Desktop Calendar lets you get organized in no time at all. With this desktop calendar software, you can use a daily, weekly or monthly view to plan your life. Add your own photos and choose from 42 virtual stickers that will remind of you of important events at a quick glance. Our desktop calendar software also includes a handy to-do list feature, and reminder alarms that can alert you up to one week before an important date. Never forget a birthday or doctor's appointment again! All-in-1 Personal Information Manager is an ergonomic personal organizer useful for managing any kind of personal information such as tasks, events, contacts, notes, file links, Web links and executable key scripts. WebinterX Ltd. Your privacy is safe - eCentral does not contain any "Spyware" or "Adware". Copyright © 2002-2019 Eshasoft. All Rights Reserved.